Notice how the largest increase in round trip time is between hops 7 and 8. Nothing much we can do here, but at least it shows that there is very little delay introduced between the gateway and ISP, meaning it probably is not our Local Network causing latency issues. 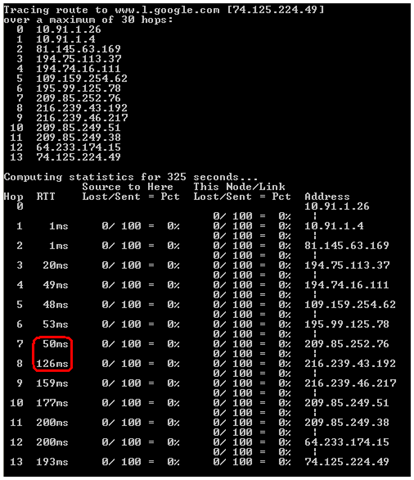 There’s valuable information included in the output, this being mainly packet loss along individual links. Bring back pathping into latency troubleshooting, it is a great accompanying tool to wireshark to help pinpoint where within a capture to focus on. Indeed it is a highly underutilized tool, I had forgotten about it myself!